HAPPY NEW YEAR 2014! Yes! 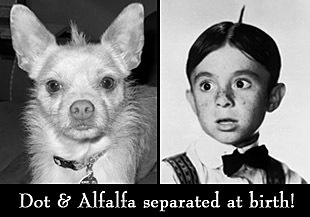 This is going to be the year we get a new Animal Shelter and Pet Adoption Center in Big Pine, California. 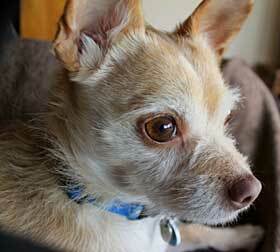 As a former resident of the Shelter (back in 2008), I can say it is much-needed and long overdue. I'm one of the lucky ones who found my forever home and my prayer is that all animals in Shelters everywhere get the second chance I got! If you'd like to learn more about ICARE's "Raise the Roof—a Cause for Paws" fundraising campaign and how you can help, please click here. Wishing you an amazing New Year! SUMMER 2013 - I'm headed for the 5-year anniversary of my horrible accident. Can you believe it? 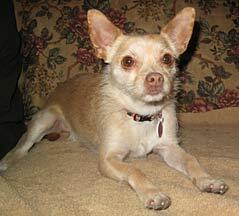 It was August 2008 when I was hit by the car that broke both of my back legs and landed me in the Animal Shelter. Good thing, too, cuz that was where my life was literally saved thanks to the ICARE Stitch Fund. If it hadn't been for the fund, I would have just been another sad statistic. If you're not familiar with my story, you can start from the bottom of this page and start reading. If you already know me, then I'll just say I continue to count each day as a blessing. For those of you who helped with the cost of my surgery, I am making you proud by being the best little companion to my adoptive family and 4 furry canine siblings. Thank you from the bottom of my heart. 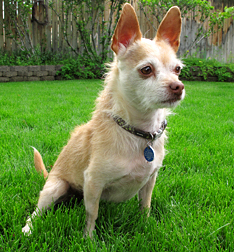 You made a difference for a Chihuahua that the world might not have missed one way or another, but I'll tell you, I would have missed out on my amazing life these past five years and, to me, that would have been a tragedy. HAPPY 2013! 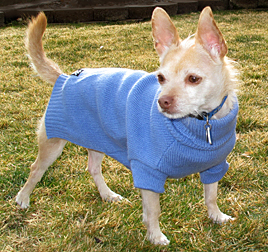 Yeah, I got a new sweater for Christmas and I'm looking pretty darned cute! 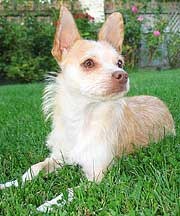 I'm luckier than a lot of dogs and I should know because I did some time at the Animal Shelter myself back in the day. 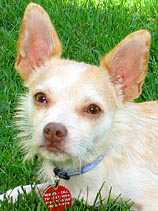 Speaking of the Animal Shelter, me and a lot of other dogs, cats and nice folks are praying that 2013 is the year Inyo County will move forward with plans for a new Animal Shelter in Big Pine, California. My mom made a video of the Shelter so everyone can see it for themselves. It is an 85-year old block cement dairy barn that was never meant to house cats and dogs and is just not cutting it as a humane animal care facility. If you agree, please contact the Inyo County Administrator at 760-878-0291. 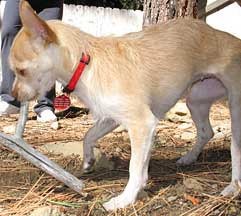 In honor of Dot's 4th Rescue Anniversary, here's a new video of her playing with her canine siblings in the back yard. Hope you love seeing her so happy and active! Greetings from Ventura, California! Okay, does it get any better than this?! 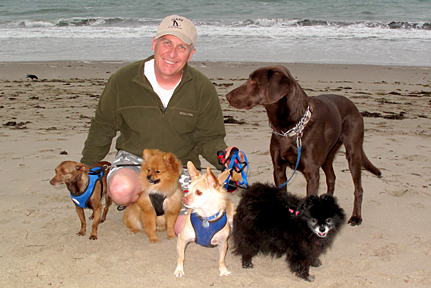 Here I am with my family (left to right: Zuki, Ferris, me, Mrs. Tiggy Winkle and Beans and, of course, my human dad, Ted) vacationing in beautiful Ventura, California the first part of May 2012. My human dad works very hard — he's the Air Pollution Control Officer for the Great Basin Unified Air Pollution Control District. Anyway, when he takes a much-deserved vacation, chances are about 100% that he will be bringing me and the canine crew along for the fun. How's that for the best dad ever? I guess you could say I am living La Buena Vida (the good life! ), baby! Fall 2011 - Lake Tahoe Yipeeee! 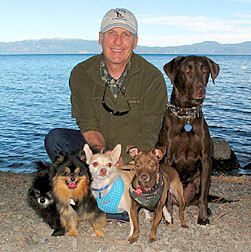 Spent the last two weeks kickin' it with my homies (Mrs. Tiggy-Winkle, Yogi, me, Zuki, Beans and dad) in Lake Tahoe! It even snowed while we were here — that was lots of fun, too. You wanna know a secret? Every day is a vacation for me, no matter where I am, as long as I'm with my family. Life is pretty awesome! Dog Days of Summer 2011 I don't know about you, but I LOVE summer! 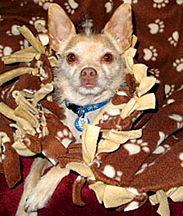 I guess it's because I'm mostly Chihuahua and we don't really like the cold. I've been doing a lot of sunbathing and counting my blessings. Hey, I just realized it's been three years since I was hit by that car that broke both of my back legs on August 2, 2008. If it hadn't been for the ICARE Stitch Fund, I would have been a goner! Thanks to the donors who helped pay for my surgeries, I survived to enjoy these past three years to the fullest. I do walk kind of funny with my one stiff back leg, but, heck, I can still move pretty fast — just check out my YouTube video (see link at top of page). If you have pets of your own, I hope you are giving them lots of love and appreciating each day you have with one another. I learned (the hard way) that life is truly a gift! Enjoy your summer! P.S. If you want to send me a message, click on the Guest Book on the left. Spring 2011 Okay, I admit it. 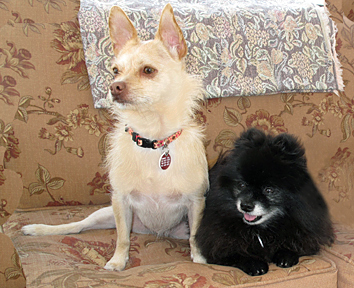 I am startin' to like my new sis, Zuki. I mean, how can I resist the way she cuddles up next to me at nap time? Since she's here to stay, I'm making the best of it. In other news, I celebrated my third birthday on Valentines Day (that's the day mom and dad picked for me cuz they say I'm their little sweetheart!). Yeah, life is pretty great and I know I hit the jackpot. My prayer is that all homeless dogs (and even cats) can find their forever homes and know the joy of the love that I've found. Amen! December 2010 - Happy Holidays? Did I look like I wanted a baby sister? Did anyone bother to ask me if I wanted a lil' sis? Yet, here she is, this creature they call Zuki. 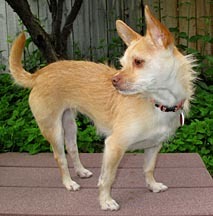 She came from the Inyo County Animal Shelter and is a Chiweenie (Chihuahua/Dachshund mix). Just a fancy word for mutt, if ya ask me! Anyway, this whole scene put my tail hairs in a twist, I ain't gonna lie. I thought, "What the heck? Don't mom and dad love me any more?" But, they explained that this pooch needed a home and she wouldn't take up much room or eat much. I decided to give the kid a chance. And, guess what? We're having a blast! Yup, that's right. We're wrestling and zooming around the house and yard like old friends. Looks like I got an early Christmas present, a new friend and sister. And, the best part is, we saved her life. 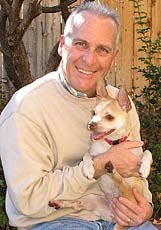 Winter 2008 -Here's Dot with her new dad, Ted Schade. These two are pretty much inseparable. After the evening walk with all the other dogs, you'll find Dot wrapped in her blankie snuggled on Ted's lap. She continues to inspire us with her incredible joy for life. If you'd like to send Dot a note, click on the Guest Book on the left and drop her a line. We'll make sure she gets it. December 2008 - Happy Holidays! Well, it was bound to happen. 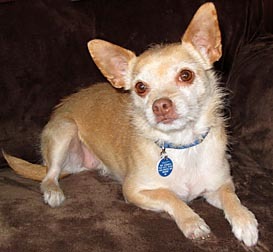 Dot has finally been adopted ... by her foster parents, Ted and Lisa! Yes, it's true. After four months as part of their family, the Schades decided to make it official and have adopted Dot as one of their own. We know one little doggie who will have a very Merry Christmas this year. Hope your holidays are filled with magic and happiness. If you'd like to make a donation in honor of family or friends, ICARE is a great organization that helps many pets in need. November 19, 2008 - Just when we thought Dot's surgeries were all behind her, another complication arises. The wire stabilizing the bone on her left back leg broke through the skin and, man, was it sharp! So, back to the Bishop Vet Hospital today, where Dr. Cheryl Chong performed surgery to remove the offending wire and, at this point, unnecessary pins. 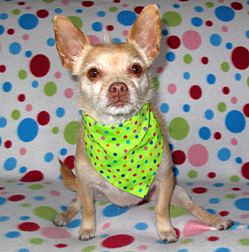 Dot is an amazing dog and accepts the cards dealt to her with a "just glad to be alive" attitude. She's resting comfortably at Ted and Lisa Schade's house. October 28, 2008 - Lazy Days of Autumn Where's Waldo? I mean, where's Dot? 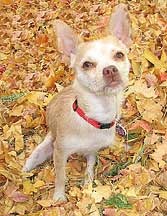 She practically disappears in the golden leaves. Here she is enjoying the fresh air and sunshine on a lazy afternoon. Dot's a typical pup — running full blast one minute and snoozing the next. She seems to have fallen for Beans, our resident Chocolate Lab (he was born at the Inyo County Animal Shelter in 2005). It's pretty hilarious to see tiny little Dot and big ole Beans wrestling and horsin' around. 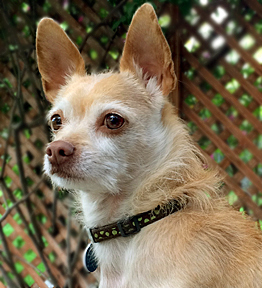 Dot would do just fine in a home with other dogs. October 9-18, 2008 ~ Lake Tahoe - Lucky little Dot! 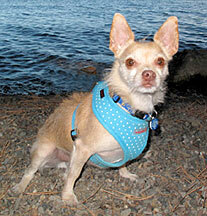 She got to go to Lake Tahoe with her foster parents, Ted and Lisa (and their 3 dogs). She is the greatest traveler. She hunkered down in her travel kennel and didn't make a peep the entire 4-hour drive! She has fully recovered from her injuries and went for long walks each day with the gang. She's enjoying being a real puppy again and is a very joyful creature. 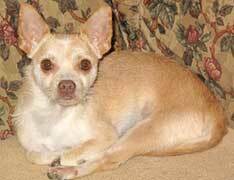 She is still looking for a loving adoptive home. October 3, 2008 - It's been 7 weeks since Dot's first surgery and she is doing very well. 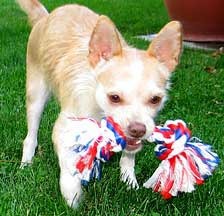 She loves to play fetch and she can move pretty darned quick, too. 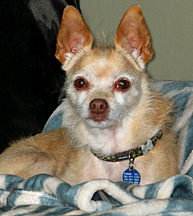 She was the featured Pet of the Week in the Inyo Register last week. Unfortunately, there were only a couple of calls from folks asking about her. 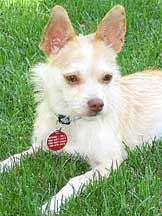 Dot is house-trained, gets along with other dogs and LOVES people! Did I mention, she is just too sweet for words? September 21, 2008 - Big Week Coming Up! 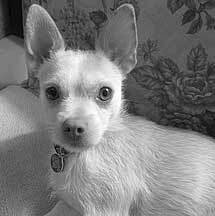 On September 22, Dot is going to the Bishop Vet Hospital for her spay surgery and more x-rays of her back legs to see how the bones are mending. She has the warrior spirit and the heart of an angel. This sweet dog thoroughly enjoys life and her joy and enthusiasm are an inspiration to all who meet her. She will probably always have a limp, but she is snot handicapped by any means. Her little hippity-hop just makes her that much more endearing. September 9, 2008 - Check-up Dot had an appointment at Bishop Vet Hospital today. Dr. Carl Lind removed the staples from the revision surgery on her right back leg. On Friday, September 5, one of the pins had worked its way out and through Dot's thigh. 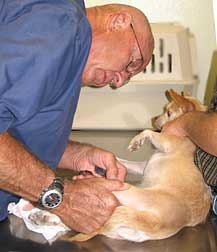 She was rushed to the vet hospital where Dr. Craig London cut the pin off as close as he could. Today, Dr. Lind was able to tap the pin back into the bone, so it is no longer protruding and irritating her skin. 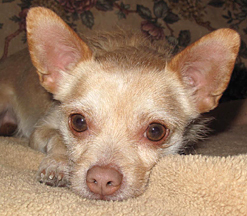 Dr. Lind says Dot is a very sweet dog, especially under the circumstances! He also says she is healing nicely and we can schedule her spay surgery in a couple of weeks. Thanks Dr Lind! September 3, 2008 - Doing Better Today Dot wants everyone to know that she is feeling much better today and her back legs are healing great. The right back leg, that was surgically corrected on August 14, is doing awesome and she is using it as her weight-bearing back leg. The left back leg that had revision surgery on August 26 is looking good, too. She's not supposed to put any weight on it and she hasn't been. She gets the left back leg staples removed next Tuesday at Bishop Vet Hospital. Dot has been a little trooper throughout the entire process. 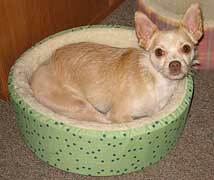 She loves her little "Dottie dog bed" and is enjoying all the cuddles and attention from her foster parents. August 26, 2008 ~ Veterinary Specialists of Reno - This x-ray shows the revision work performed by Dr. Regina Schroeder in Reno, Nevada. She performed a tibial tuberosity and elevated the quadriceps muscle with an implant. The femur had to be shortened a centimeter or two and new pins joined the femur with the broken piece. Dot is resting comfortably and being spoiled by her foster parents. 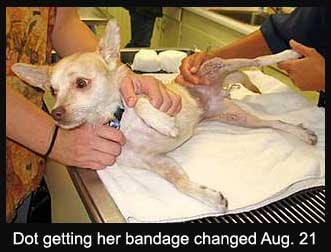 August 21, 2008 - Minor Setback Dot went to Bishop Vet Hospital for her bandage change and 1-week post-op check-up. 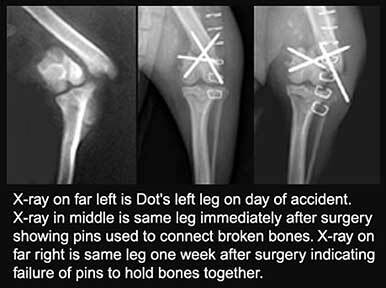 Dr. Cheryl Chong noticed swelling of Dot's left leg and ordered x-rays (see below). The good news is Dot's right leg is healing great. The bad news is the surgery on Dot's left leg failed completely and she is scheduled for revision surgery on August 26 at the Veterinary Specialists of Nevada (Reno). 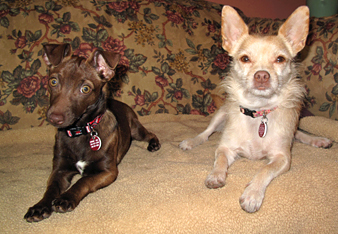 DOT'S STORY - August 8, 2008 Dot is a dainty Chihuahua mix who landed in a heap of trouble a couple of weeks ago. 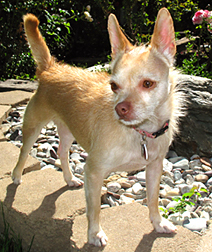 She was in heat and being chased by male dogs (spay and neuter your dogs, please!). In an effort to escape her pursuers, she ran straight into traffic on Line Street in Bishop, CA and was hit by a car. Both of her back legs were badly broken and she was rushed to the Bishop Veterinary Hospital were she was made comfortable while waiting for her owner to come forward. 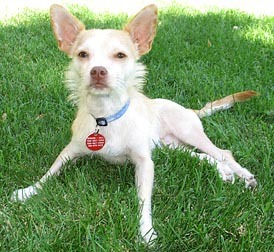 The owner did contact Inyo County Animal Services (ICAS) and decided to relinquish her to them (Lovey was her name). 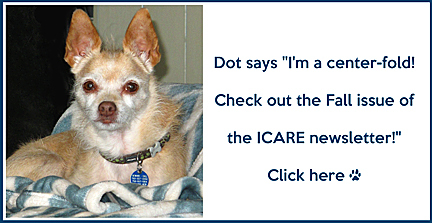 ICAS then contacted ICARE to ask if the ICARE Stitch Fund would pay for Dot's corrective surgery. Of course, the answer was "yes!" Dot was x-rayed and they were sent to the Veterinary Specialists of Nevada who agreed to perform surgery on Dot's broken legs. 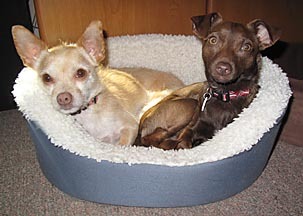 Shelter employee, Katie Bird, volunteered to transport Dot to Reno (and actually came up with her new name). Katie took her to the Veterinary Specialists. The following day, Animal Services Officer, Nancy Smith drove all the way to Reno to pick up the tiny patient and drove her back to Bishop where she is being fostered by Ted and Lisa Schade.